Pioneers in the industry, we offer flame proof exhaust industrial fan, flame proof wall mounting fan and flameproof pedestal fans from India. 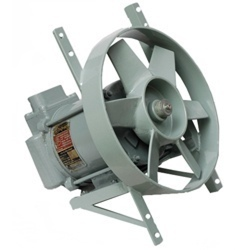 We are instrumental in offering a wide collection of Flame Proof Exhaust Industrial Fan. It is manufactured using top quality components and with the help of the latest machine at our premises. This product is widely used in various industries such as food processing, petrochemical, beverages and construction for removing heat from the atmosphere. These industrial fans are provided to clients after proper checking on the predefined quality standards. We are highly involved in providing a full-fledged variety of Flame Proof Wall Mounting Fan which is characterized by modern design, standard model, high speed, long life and energy efficient. The room temperature gets reduced by these fans in short period of time. The design of these fans perfectly aligns with modern trends of the market. The best use is for medium ceiling locations in hazardous area where there are no air circulation alternatives for plant personnel. Our Flam Proof ceiling fans are Powerful, all metal, heavy-duty and are build to excel for both summer and winter operation. Four complete lines of high quality industrial and commercial ceiling fans can efficiently achieve the air patterns necessary for any application to have energy savings. Effectiveness of existing have in hazardous area is poor. Therefore use of flameproof ceiling fans in air conditioned environments helps improve uniform air circulation resulting in energy conservation. 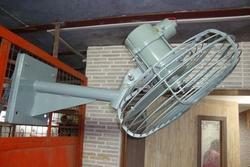 The company is engaged in the manufacturing of Flameproof Pedestal Fans all across the globe. The Pedestal Fan is a Multi-Purpose and Sumo Pedestal Fan with unmatched performance and longer service life. The Pedestal Fan is available with us at the market leading prices and can be availed in bulk quantity. Looking for Flameproof Industrial Fans ?